My second time onboard the Mabuhay inflight magazine of Philippine Air Lines featured one of my outtakes from last year's assignment in Coron. While I missed out on going back to Coron for a photo assignment for another airline this coming 25th, at least being featured again in Mabuhay is consolation enough, another welcome addition to my growing fotofolio which one can see in flickr and lagalog.com. Again, much grattitude goes to Ira of Mabuhay Magazine and of course, the Man Upstairs for this wonderful privilege. I also thank Coron for being such a blessing to me. Seems that ever since my assignment there, things are opening and looking up as far as my photography career is concerned. Truth to tell, I would love to go back and while the skeds didn't allow me to take on a Coron assignment offered to me this month, I know, in time I will go back there. ei wulfriend! hahaha, suwerte uli :-P sana nga many more to come. thanks my friend! ayos bro oggie. kasi parang may mga mabuhay magazine akong nakikita sa recto. sana makita ko tong issue na to. oggie siguradong madadagdagan pa yan. sa tingin ko nga, simula pa lang ito. ei dom, thanks man. i wish i can give you a copy of the mabuhay kaya lang they only give ONE copy after a month pa. if i can get more, i will. but rest assured, i secured a copy of inflight na for you. how i wish i have the same talent. how i wish i have the same camera. ayos na ang inflight! itong mabuhay malamang makakahanap pa ako nito. very nice! 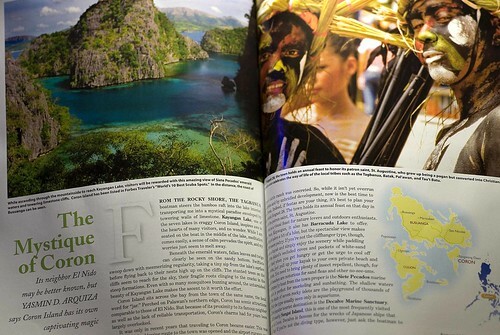 i was rummaging nga through the pages of Cebu Pacific's smile hoping na i can see one of your shots there too. im 300% sure marami pang ganyang opportunities for you in the future. you are a generous person but God cannot be outdone in generosity that is why He has been giving you opportunities left and right. marga, thanks so much for the well-wishes. i really appreciate all your kind words.